Your Words Have Power. God’s Word is the most powerful thing in the universe today! You have authority to give voice to His Word. Charles Capps is a retired farmer, land developer, and ordained minister who travels throughout the United States sharing the truth of God's Word. He has taught Bible seminars for thirty years, sharing how Christians can apply the Word to the circumstances of life and live victoriously. 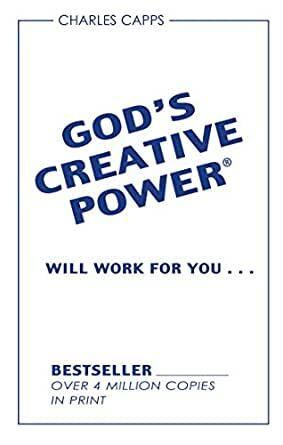 Besides authoring several books, including the bestselling The Tongue-A Creative Force, and the minibook God's Creative Power, which has sold over 3 million copies, Charles Capps Ministries has a national daily syndicated radio broadcast and a weekly television broadcast aired over several networks called "Concepts of Faith." 5.0 out of 5 starsHands down the most important message i have ever heard thus far since being alive. This pamphlet has been extremely revised/shortened, from it's original version of the '70's. This was a big disappointment since I was counting on reading and again memorizing all the verses and paraphrased verses as Charles Capps had written them. Charles Capp is solid in the word of God. I would recommend this book to anyone who's looking to change how they are speaking to their situation. 5.0 out of 5 starsThis Book Changed My entire LIFE! A friend gave me this book in @2006 at a company that I worked at. I was a new Believer and I was desperately seeking God. I wanted to know Him and I wanted power in my life! I spoke the confessions for 2 years before work and after work. I can give you a snippet of the past 7 years' of my life. My relationship with God is amazing! I still wake up excited to pray, read, confess and live out this Word. I went from living in an apartment to building a home, closer relationships with my children, recovered from a divorce and bankruptcy to marrying again and a 6 figure income. I have a faithful, Godly husband and children that are honorable and respectful. I still have the original book my friend gave me (the cover fell off), I have a CD with the confessions and I have given away dozens and dozens of this book. It is a little book that you can carry in your back pocket or your purse full of scriptures. Can you get this from your Bible? Sure you can! Yet, will you? Mr. Capps takes the Word and puts it in "cappsules" and teaches you succinctly why it is so important to speak it out loud daily. I don't know...all I know is if you want more of God, if you want power, if you want to speak His Word and live in His fullness then you want to get this book! I actually bought the Capps booklet that goes hand in hand with this...Healing Power. There is some of the same information in both: the Power of God's Word when we need healing (physical, spiritual, emotional). I believe in the miracle of healing since I have witnessed it. I'm reading this booklet but it is the healing booklet that I recommend with this one. I've bought dozens of the healing booklet and share them with others who are seeking physical healing. If you have faith, it is an excellent resource.